JAKARTA, Indonesia, Oct. 25, 2018 /PRNewswire/ — Yili Group announced the release of 11 new products aimed at the Southeast Asian market during a press conference in Jakarta, Indonesia on Oct 23. Attendees celebrate the launch of 11 new ice-cream products by Yili Group at a press conference held in Jakarta, Indonesia on Oct 23. The launch of Joyday ice-cream products marks our entry into Southeast Asia and we look forward to providing quality products to new markets, said Zhang Jianqiu, executive president of Yili, speaking at the press conference. At present, the new products are available in four Indonesian cities — Jakarta, Medan, Surabaya, and Bandung. And the company has plans to roll them out to a further 20 cities across the country. With a population of 264 million, Indonesia is the largest economy in Southeast Asia. In recent years, it has developed extensive economic and trade ties with China — powered by the Belt and Road Initiative (BRI). Our expansion into Indonesia is part of our efforts to build a presence in the global market, said Zhang. 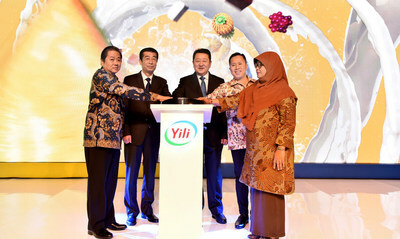 Feng Yuzhen, mayor of Hohhot, said that Yili should work to offer a larger range of quality and healthy products to customers in Indonesia and around the world. The company has previously revealed that it plans to make its products available to 2 billion consumers by 2020. And its new range of products in Indonesia is sure to help it meet that target.